A few years ago, Sony released their first port of Firefox OS, for the Xperia E. Since then, Sony has started the Open Devices initiative to bring support for AOSP (the Android Open Source Project) to many more of its smartphones. The porting work described in this post is based on this effort and brings Firefox OS to a dozen different Sony devices. 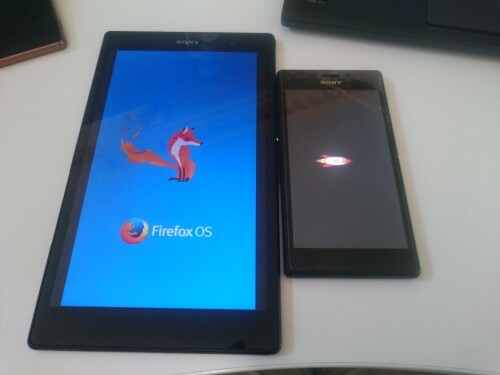 Builds of Firefox OS for a number of Sony devices are now available from the FXP project. Thanks to Adam Farden for his work on improving the default look and feel of unbranded Firefox OS builds, and hosting these images. These builds also have over-the-air updates, so you can stay up to date as Firefox OS continues to improve! They’re built from the nightly branch of Firefox OS though, so make sure to back up your information regularly. TIME! It will take overnight to download the source code. I am not joking! Expect it to take 10 hours or more to fetch the entire source tree. Firefox OS sits atop a number of other projects, including Linux, the Android Open Source Project, and many others. Building a smartphone image is not like building the Firefox browser, or even like compiling a custom kernel. DATA! Flashing your device will destroy the existing operating system and may delete your user data. Always do a complete back-up of any information you want to keep. BRICKS! Flashing a new operating system on a device always comes with the risk of rendering the device permanently unusable. It’s rare, but possible. Sony provides an official tool called Emma. It works with the S1 Bootloader flashmode so the chances of completely destroying a device are indeed very low and mostly everything can be saved by this tool. It is very simple to use and documentation is available. It’s running in Windows but we have been using it successfully in VirtualBox: don’t forget that the USB IDs for S1 Bootloader mode are different. So you need to force your device to be attached to the virtual machine. Oh, you’re still here? Great, but don’t say we didn’t warn you. Read on to learn how to build Firefox OS for your Sony device! 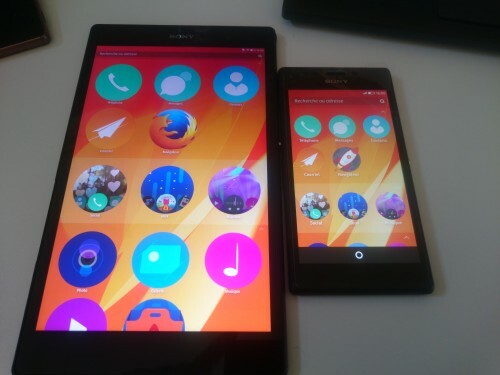 Firefox OS currently has support for the Shinano and Yukon Sony device platforms. This means that you can build for the Xperia Z2, Z3, Z3 Compact, Z3 Tablet Compact, as well as the E3, T2 Ultra. Support for the Xperia M2 should be available soon. You can see the full list of devices that are supported on Sony’s website. Note that your device to be flashed must be updated to Android Lollipop (5.1) prior to flashing. Most features of Firefox OS are tested and you can expect these to work. This includes phone, SMS/MMS, and data connections, as well as device capabilities such as Wi-Fi, GPS, Bluetooth, and NFC. The only major exception to this is the camera. The Sony team is porting the camera, and we’ll update this post when they’ve completed that work. The FM radio is also not yet supported. Areas where you might see variable support or some bugs are in audio/video decoding and processing, and hardware acceleration. Make sure to report a bug if you see a problem in these areas. Instructions for reporting issues are at the bottom of this post. 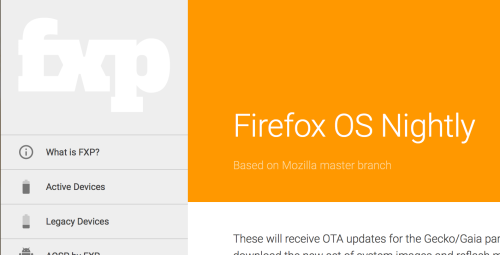 Mozilla’s developer site, MDN, has extensive documentation on building Firefox OS for devices. Currently the only supported operating systems for building Firefox OS are 64-bit Linux. Start by installing the prerequisites (things like Git and the Android SDK) and setting up your build environment. Follow the directions there and you’ll be just fine. Once you’ve the build environment taken care of, you’re ready to get the source code. Remember, this may take many many hours! The code comes from many different repositories, and can take 10 hours or more even over a fast internet connection. Make sure you have at least 20gb of free disk space available for the source code and the build files that you will be generating. * Clone the root repository of the project, which downloads the build scripts. This takes about a minute over a decent connection. * Configuring for your device, which downloads all the B2G and Gonk source code and some configuration files and libraries specific to your device. This can take 10 hours or more over a decent connection. * Compiling into a device image which can be flashed to the device. This step should take about an hour on a decently powered desktop computer. The immediate next step is to go sleep. Or drive to visit your grandmother. Or see if you can run a marathon before the source code finishes downloading. Now go watch half of a movie, or see how many push-ups you can do in an hour! 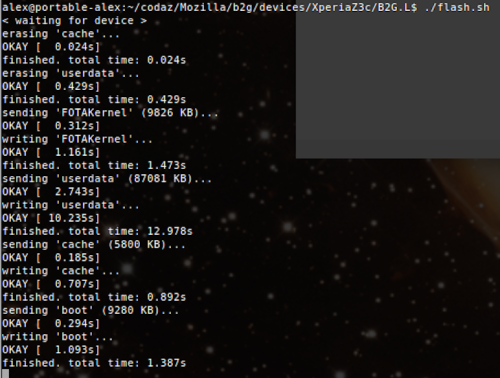 After the flashing process is complete, your device will reboot into Firefox OS! That looks great, how can I help? There are several ways you can contribute and stay in touch. One of the most obvious is getting access to a device already supported, and using it and reporting bugs. Another step forward is hacking the device to help maintain it, making sure bug are fixed, and providing a smooth user experience. For those of you who are brave enough, you can help bring support for more Sony Xperia devices. The list of devices supported by the Open Devices project is bigger than those currently working with Firefox OS. For example, hacking to get the Z1/Z1 Compact series (Rhine platform) would be a good start. Got questions about running Firefox OS on new hardware or devices? Try the dev-fxos mailing list or #fxos on IRC. Thanks! Now, do a tutorial on how to upgrade to the latest nightly on ZTE Open C. Seriously, many people (including me) are stuglling with that see http://www.reddit.com/r/firefoxos for example. Thank you sir SO MUCH. Do these builds update the base OS to Android 5? Where do I found the list of “device name” for the config.sh command? Once you clone the B2G repository per the instructions in the post, you can execute “./config.sh” with no arguments and it will print the list of device names. One year ago I bought an Alcatel One Touch fire here in Italy. The operator (TIM) removed tethering functionality, shipped the phone with an old FFOS version and didn’t provide updates. Someone helpfully provided me with a custom build of FFOS which did tethering, but unfortunately is buggy. Can I find newer builds for this phone somewhere? Some news about port to Xperia M2 ?